Obsessed with this jumpsuit for spring! It's finally getting warm around here & I'm excited for lots more outfits like this one! I have a lot of great content coming up for you guys for spring but I want to hear from you! If there is something special you want to see styled or want me to write a post about, leave me a message in the comments section of this post & I will work it into my calendar!! Tried a little something different last weekend - socks & sandals!! This is one of those styling ideas that is usually considered to be a faux pas, but I've seen people pulling it off recently and wanted to try it out for myself! I opted for all black, especially for the socks & sandals so they blend together to almost look like booties. I kind of like how the look turned out & bright side, I was able to pull out my sandals & my feet still stayed pretty warm ha! So you tell me, did I pull it off or not so much?? Not sure what it is about the color, but purple has never been my favorite TBH, so I never thought I would see the day that I wore a shade of purple on my blog, but fashion is all about risk-taking right? Summer is definitely my favorite season overall but fall/winter are my favorite seasons to dress for! So many layering & accessory options! This top came in my latest Stitch Fix box & it was definitely a keeper! How cool is the lace up back? Follow along for more @michelle_orsi on Instagram! If you must narrow down your spring shopping list, make sure you keep a floral dress on the list! Florals in spring are classic and always end up being some of my most worn pieces of the season. I love structured florals, oversize florals, boho florals...if it has a floral print in the springtime, I'm in. 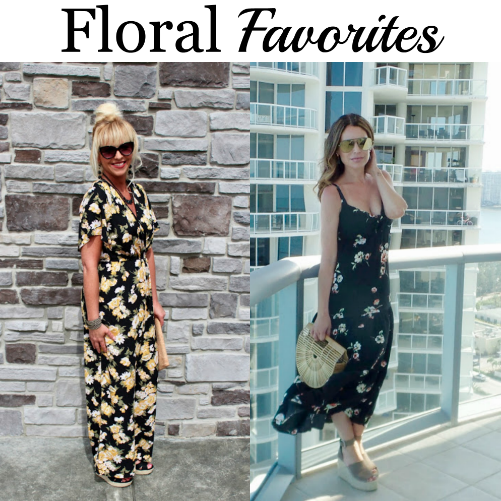 Check out 10 floral dresses I'm loving right now! My bridal shower is in less than a week & I am so anxious/excited for it! Next week I'll share the outfit I end up wearing to my shower but today it's all about bridal shower outfits for guests! How gorgeous is this lace midi dress? I actually contemplated wearing it to my shower myself but then decided that I wanted to wear white! 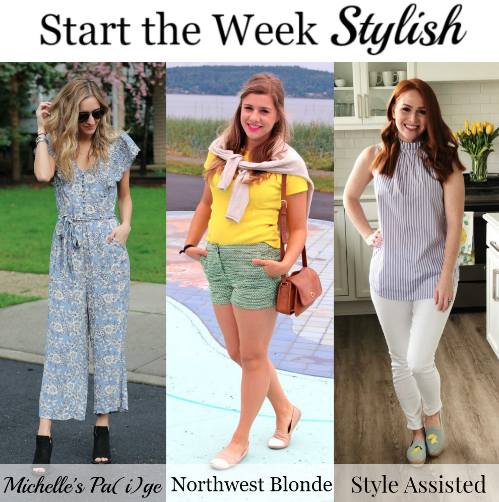 Check out more bridal shower guest outfit options below! Spring weather is slowly but surely creeping it's way in & I am so excited! Today I'm sharing 3 easy pieces to start wearing as the weather transitions. 1. Peep toe booties - Time to swap your winter boots for a pair of peep toe booties. These are the perfect compromise of a bootie & a sandal, just a hint of a pretty pedicure but your foot is still basically covered up. I love wearing this pair with everything from jeans to dresses to joggers. 2. Leather Jackets - Time to shed your winter coats & opt for more lightweight styles. I love wearing my leather jacket throughout the spring. It's the perfect weight for spring days & adds edginess to all of my outfits, which I love! 3. White Jeans - The easiest way to get in a spring state of mind in my opinion is to start wearing spring colors. I wore my white jeans throughout the winter, but spring & summer is when they really start to make an appearance in my wardrobe. I love the crisp white color for warm weather. Time for one of the most fun parts of wedding planning...choosing my shoes! Today I'm sharing 5 options that I'm considering. Let me know your favorite choice in the comments! Designer: Is there anything more classic than red soles? Every shoe that Christian Louboutin makes is a stand out & although they are expensive, a wedding is the perfect time to splurge on a pair of fabulous shoes! Colored: I love the pretty pink shade of these shoes & think wearing a colored shoe would be such a fun surprise under a wedding gown! Budget Friendly: This pair is just under $100, has a low heel for all day & all night comfort. Plus it comes in 7 colors! Something Blue: Trying to think of how to incorporate your 'something blue' into your look? Try a blue shoe! Comfort: Part of me, just wants to forget heels altogether & grab a fun pair of sneakers. I love that the sequins and ribbon tie on this one make them glamorous! Happy April! For those that celebrate, hope you all had a great Easter! Thought we would kick off the month with some rainy day prep. As they say, 'April showers bring May flowers' & today's raincoat options are super cute for rain or shine. Scroll down to shop some of my favorites!